We’d love your help. 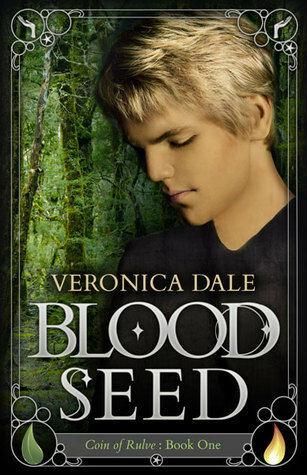 Let us know what’s wrong with this preview of Blood Seed by Veronica Dale. Eighteen-year-old Sheft has good reason to fear there is a dangerous connection between himself and a deadly entity that haunts the nearby Riftwood. Already despised as a foreigner, he keeps himself apart Sheft—maligned, hunted, chosen. To ask other readers questions about Blood Seed, please sign up. 'Blood Seed' is a powerful tale of survival, love, struggle and strength with immaculate imagination that is masterfully penned down with rich & exquisite descriptive prose and intricate narrative. A creepy darkness from Riftwoods has been engulfing Sheft's freedom to happiness all his life since childhood, forcing him to stay aloof and isolated until Mariat's love brings with itself the power of self discovery for Sheft and the stre Impeccable read with multidimensional, mysterious entities. A creepy darkness from Riftwoods has been engulfing Sheft's freedom to happiness all his life since childhood, forcing him to stay aloof and isolated until Mariat's love brings with itself the power of self discovery for Sheft and the strength to overcome terrible adversity and difficult upbringing. The characters are believable, many rooting interests, so the readers for the characters plights and their triumphs! The scenes are vivid, the details, create a lasting impression, even long after the covers are closed. The writing is easy to read, so I flew threw the book; kept flipping pages, because I wanted to find out what would happen next. Excited to see what will happen in the next book! Sheft is an eighteen-year-old who harbors a deadly secret: his blood, when shed, attracts a terrifying entity that threatens his small village. Convinced that he is a danger to all around him, Sheft keeps himself apart. So when he falls in love, it's an unexpected (and in some ways unwanted) experience that he believes can only lead to tragedy. That's the basic gist of Blood Seed. Veronica Dale could easily have stopped here, focusing on the developing romance and Sheft's struggle to break his bo Sheft is an eighteen-year-old who harbors a deadly secret: his blood, when shed, attracts a terrifying entity that threatens his small village. Convinced that he is a danger to all around him, Sheft keeps himself apart. So when he falls in love, it's an unexpected (and in some ways unwanted) experience that he believes can only lead to tragedy. That's the basic gist of Blood Seed. Veronica Dale could easily have stopped here, focusing on the developing romance and Sheft's struggle to break his bonds of isolation. But events move in a different, more complex direction and love serves only as the starting point for a journey that leads Sheft to find out more about his role as a strange attractor to underlying supernatural forces at work in his world. It's difficult to categorize Blood Seed - and that is part of its attraction. In a book world replete with formula genre reads, Blood Seed offers up something different: a potent mix of fantasy, romance, intrigue, and a believable protagonist whose current dilemma is just the beginning of his evolutionary process. Descriptions of how Sheft balances the passions and promises of love while struggling with a seemingly invincible curse are compelling and poignant, as are those of Mariat's increasing and unbreakable involvement in his life. They drive the underlying fantasy and horror elements in the story. With Blood Seed holding the power to attract so many different genre readers with its fantasy, romance, supernatural, and horror elements, it's a challenge to neatly categorize its audience. Readers journey through a strange land in Sheft's footsteps, partake of his agonies and ecstasies, and ultimately revel at his tenacity and strengths. Is there a curse, or isn't there? Can what is broken be healed? And will the process of discovery change Mariat's own life? Certainly it's changed Sheft's world, which moves from the hidden powers of an isolated loner to something much greater. What each will become, and the events that take place in the eighteenth year of Sheft's life, provides an action-packed saga that carries readers on an evocative journey that holds no pat ending. Fans of genre crossovers who appreciate romance, powerful protagonists, and coming-of-age reads will relish a touch of the unexpected in the complex world explored in Blood Seed, the first book of the four-book series Coin of Rulve. Well done! I really enjoyed this book. The characters are vivid and I truly cared about Sheft and Mariat and what happens next. Can't wait for the next book. Originally published at A. M. Aitken on October 22, 2016. I loved the characters and the page-turning suspense in Blood Seed. It's beautifully written, with a highly-charged atmosphere that builds tension throughout the story. At points I was saying 'yikes' out loud as I read. Highly recommended for anyone who likes novels that take them away into intriguing new worlds and make them forget they're reading. Dark Twin: Coin of Rulve Book Two, and Night Cruiser: Short Stories about Creepy, Amusing or Spiritual Encounters with the Shadow. Newest published is Time Candle, the third book in the Coin series. Reviewers have called my books "genre-bridging," in that they include dark fantasy, romance, and the spiritual journey. They are dark, to be sure, but there's always light at the end of the tunnel! Many of my themes have roots in Carl Jung's concept of the shadow and in J.R.R. Tolkien's idea of the "eucatastrophe," the belief that even the worst catastrophe can be redeemed. Like many of my favorite authors, I believe spirituality is a part of what makes us human. My fiction has received commendations from Writer's Digest, Writers of the Future, Midwest Book review, and the five-star silver seal from Reader's Favorite Book Review. Blood Seed received the month's Best Ebook Cover award from The Book Designer. I hold a couple of master's degrees and graduated from the science fiction and fantasy workshop Viable Paradise. I'm also an Established Author with Detroit Working Writers, a member of Phi Beta Kappa, and an ethical author with the Alliance of Independent Authors. Some years ago I was lucky enough to actually touch a wild whale calf off the coast of Baja California. I love dark chocolate, and am a fan of Star Wars and the Holmes-Data-Spock archetype.